Bees have been heralded as an indicator of environmental health for some time now and there is growing concern that the increasing decline of these small furry flyers could spell disaster for our own survival as a species. No other animal plays a more significant role in producing the fruit and vegetables we humans take for granted, so how can we encourage more bees? One way is to grow herbs. Herbs have many uses in cooking, for medicinal purposes, for their unique range of fragrances and as food for bees and other beneficial, pollinating insects. When you start looking at the nectar content of the flowers of some herbs, it seems as though herbs and bees were made for each other. 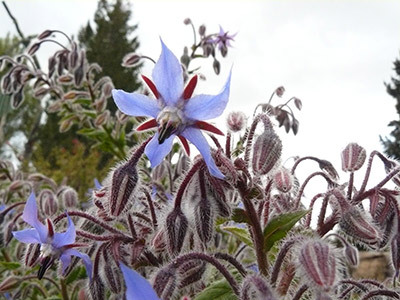 One exceptional example is borage, which refills with nectar every two minutes. Comfrey is another popular herb with the bees, refilling every 45 minutes on average. These plants are abuzz with bee activity at the height of flowering. You may not have space for a large kitchen herb garden, but it is possible to squeeze in a few herbs somewhere. By accommodating bee-friendly plants and flowers into your immediate environment, you will create a sanctuary for honeybees and other beneficial pollinators. Ideally, when you are positioning herbs for bees, put them in groups. Collections of bee-attracting plants are easier for pollinators to locate and, importantly, it conserves vital energy stores, meaning nectar and pollen can be returned to the colony more efficiently. Having a range of herbs that flower in succession goes a long way to providing bees with a reliable, sustainable food source. We all love a bit of thyme, bees most of all! Chives are one of the easiest herbs to grow and have been on the menu for humans for more than 5000 years! Try garlic chives for an even stronger taste sensation. Bees: Allow chives to flower and watch the bees hone in on them. Me: Snip chives into salads, scones, scrambled eggs, onto pizza or into pasta for a fresh herb taste. Growing tips: Chives do remarkably well in pots placed in a sunny spot. As soon as they have filled up the space in their container, they can be carefully separated to produce a host of new plants. Chives respond very well when watered regularly with liquid plant food. Bees: Lavender, with its abundant display of flowers, is an attractive herb that bees find irresistible. Me: Flowers can be dried to make potpourri, added to cake and biscuit recipes and infused in oil to make massage creams. Growing tips: Lavender is a hardy plant hailing from the dry regions around the Mediterranean, therefore it does not like having its roots in water. It likes to sit snugly in a well-draining pot. Lemon balm (from the mint family) is the perfect plant for people and bees to enjoy. Bees: Bees love the presentation of the upright stalks with masses of flowers from which to gather nectar. Me: The leaves of lemon balm make a refreshing tea, excellent chilled with ice in summer. Growing tips: Lemon balm likes living in a large pot in partial shade and benefits from regular watering. 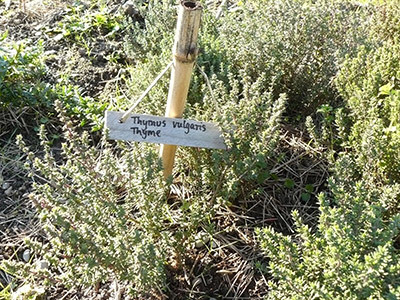 Thyme – we can all benefit from more thyme in the garden! Bees: Slow growing, thyme produces a profusion of flowers for the bees. Me: Thyme tea soothes a sore throat, and the leaves can be used fresh or dried in stews, soups, sauces, pesto and herb breads. Growing tips: Thyme is one herb that is quite happy to “hang out”. Plant several cuttings in a hanging basket and watch it grow and flow down in a profusion of easy-to-snip sprigs. Oregano has been used for centuries for both its excellent taste and health-giving properties. Bees: Honeybees are extremely attracted to oregano. Plant a variety of pinks and whites in pots or hanging baskets on the patio for the bees to enjoy all year round. Me: Having oregano at the door makes it easy to pluck a sprig or two for pizza sauce or a winter stew. Growing tips: Oregano does best in full sun, in well-drained soil. The more sun oregano receives, the more pungent the flavour of its leaves. Borage may have somewhat of an ungainly, weedy character, but bees love it!